Christiansfeld a Moravian Settlement was founded in 1773 by the Moravian Church, following a strict city plan. 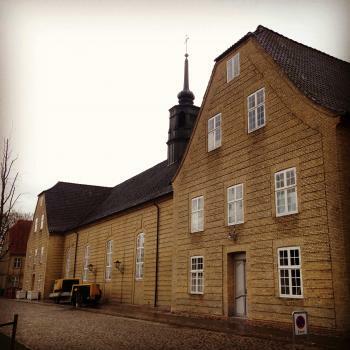 From the German village of Herrnhut, the first Moravian missions were directed to the Dano-Norwegian Empire. Christiansfeld is the best-preserved example of such settlements in Europe. 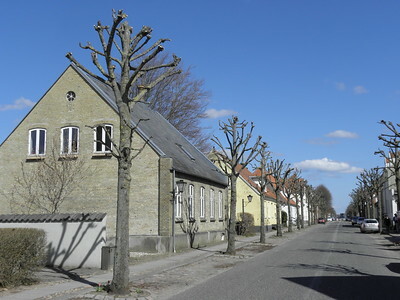 The town was named after the Danish king Christian VI. The Herrnhutter or Moravian Brethren are a Protestant denomination originating from Bohemia, whose members settled in Saxony (now Germany) after being persecuted in the Catholic Habsburg lands. There they established a new village called Herrnhut, and from that place they started the first large-scale Protestant missionary movement. They sent their missionaries to all parts of the world. Denmark (or more accurately: the Dano-Norwegian Empire of that period) was one of the first places they went to. 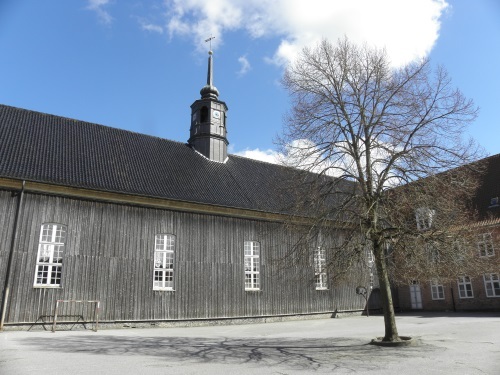 Christiansfeld is an easy site to visit on the way between the Jelling WHS and the Hamburg Speicherstadt TWHS, and well worth a short stop. I was there in April 2013 and I walked Christianfeld’s picturesque main streets in about half an hour. It’s a small town that has preserved its planned layout and original architecture well. The straight roads still are lined with rows of linden. The sturdy houses are made of light coloured bricks. The building style is very sober, in accordance with the Moravian principles. 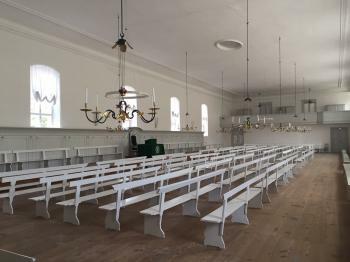 The undoubted highlight of the town is the huge wooden Moravian Church, located at a fine small square that would not be out of place in Holland. No wonder, as the Dutch town of Zeist is said to have been used as an example for Christiansfeld’s construction. After my visit in 2013, I believed that this nomination would need a brilliantly written nomination file to convince ICOMOS and the WHC. 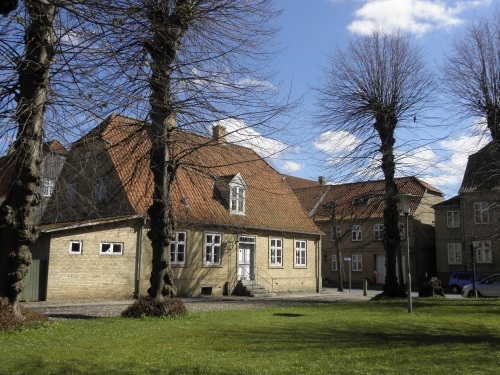 Two years later we know that it has received a positive recommendation for inclusion by ICOMOS, so you may guess that the Danes have succeeded in doing so. The dossier however is not without its flaws, and we might see a transformation of this single ‘group of buildings’ into a transnational serial site over the coming years. We have discussed the Moravian Heritage Network on our Forum before: it is (or was?) a network of Moravian settlements in Northern Ireland, the USA, South Africa, Germany and The Netherlands. They have worked together for some years on a joint nomination, but Christiansfeld has chosen to go ahead on its own as the others are not ready yet and “because Christiansfeld is the best remaining example anyway”. In its evaluation, ICOMOS does not fully agree with this conclusion: it may be the best preserved in Europe, but the serial nature of these church colonies around the world must be stressed. While the OUV of Christiansfeld is enough to earn a place on the WH List, the AB urges other countries (outside of Europe) to add serial sites in the coming years. Towns in the US may qualify (such as Bethlehem, Pennsylvania), but maybe also places in South Africa, Tanzania, Nicaragua or the Danish West Indies. So it will be interesting whether we will see any 'Moravian heritage' activity on future Tentative Lists. An aspect of Christiansfeld is that it must be one of the most northern cities in Germany for about 55 years. After the war Germany-Denmark 1864, the border was placed some kilometers north of Christiansfeld. (The German land survey marker still stands in a dike along the old highway.) Then, after 1 world war, the referendum about new border Denmark-Germany took C. back to Denmark. This border from 1920 still is in place and we can study the further aspects in the new WHS Hedeby and Danevirke in Germany. Visited Christiansfeld during weekend tour from Copenhagen in September 2017. I liked this quit unusual city and the whole story behind Moravian church. The most imppressive site for me was also cemetery with the funeral plates that haven't changed in the last 200 years. Also central church with minimum decorations and white benches looks like discussion hall rather then ritual place. It's not a stunning place, but I certainly felt something special about this community. The core is quite small and it would take an hour to explore everyting. I also visited Christinero, a small park within several kilometers from Christiansfeld. This is romantic getaway place for the wife of the chamberlain Christina Frederica von Holstein (1741-1812). Several original buildings, uncluding Chapel and Pavilion are preserved in the park. I visited this WHS in July 2016. 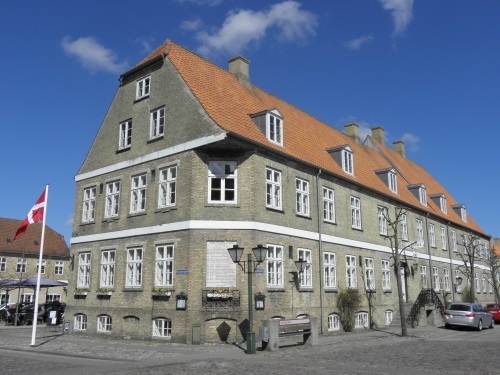 I drove to this small town from Stevns Klint and without noticing I had parked just in front of the main square and Moravian church. Visiting on a weekday meant that the town was less of a tourist museum when compared to the weekend. The town planning is intact and although there is a heritage trail marking around 27 sites to see, 25 of these sites are practically one next to the other on two parallel roads so it is very easy to visit. The main church facade is quite plain in line with the Moravian way of life. The rear of the church is covered in wood like other interesting dwellings nearby. I kept going round in circles trying to find this interesting feature (Els' photo) only to find out that on weekdays it is used as a kindergarten/school playground. There's even a metal goal post attached to it! The plain white interior is being refurbished at the moment and will not be accessible at least till the end of November this year. Perhaps this is why I preferred the quiet Tyrstrup Church. I wandered around the heritage trail and strangely enough the real highlight of my visit was the Moravian cemetery also known as God's Field. 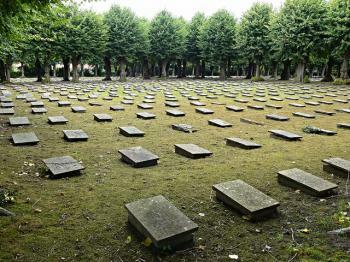 The cemetary is built in the shape of a cross and is lined with tall lime trees. What struck me most was that there were no family burial places. Women or community sisters are buried to the right and men or community brethren are buried to the left, exactly like the congregation is seated in the Moravian church. The majority of the graves are identical as a symbol that after death all are equal. The oldest graves are from the 18th century and are made of stone. Although some of the graves are damaged and the engravings are covered with moss or fading, a special effort is being done to restore them. The newer graves are made of marble which is a pity as I really like the symbol of equality. The majority of the sisters and the brethren had the name Christian in their first names, middle names or surnames, after the king Christian VII. After a short coffee break at the fabulous Xocolatl coffee shop for some gingerbread and honey cakes, I drove for a few kilometres to visit the last 2 sites near Tyrstrup: Christinero and the inscribed bole house. A bole house or bulladen is a typical Jutland timber building built with horizontal oak planks between vertical upright planks. the one in Tyrstrup was built in 1668 and it is the largest bullade in Denmark. Christinero is an enjoyable late 1700s park. It is named after Christina Friederica von Holstein, who called it "My thoughts". Her white wooden farm, Favrågård, lies at the heart of this park (around 2km from Christiansfeld). All in all I enjoyed my visit and although this site might fill in some gaps in the WH list, I don't think the site alone has OUV. Perhaps this WHS will be used in the future to extend the inscription to other Moravian settlements worldwide and become a transnational WHS which I think would be worth a try. Whilst pleasant there isn't a huge amount to see in Christiansfeld. I actually drove through the main sights without noticing, eventually parking on what I thought to be a well maintained back street garden only to find that it was actually the central square. Some surprisingly sleety drizzle pushed me in the direction of the recently refurbished museum. It seemed some sort of local meeting had just finished, and the well-dressed inhabitants were discussing the events whilst I perused the exhibits, which gave me as thorough a rundown of the town’s importance as I needed. I also discovered that the main church was closed for a long term renovation. Then I headed out to tour the town, about 10 minutes later I was back on the same square having seen pretty much everything in the inscribed area. There was a pleasant tree lined path leading to the well planned cemetery, and some well-maintained houses and that was about it, well for this non-specialist anyway. Perhaps a guided tour could explain some of the details of the town plan that reflect the Moravian Brethren a little more. I had however saved the best for last. Apparently the town has a famous contribution to Danish cuisine, Honnigkage (honey cake), it was news to me but it was a very welcome addition to my travel diet. There were two shops opposite each other selling it. I plumped for the one that also sold expensive chocolates, it was utterly delicious. Much to my surprise they also sold a very good quality latte. Two students that interviewed me for their research said the cake in the shop opposite was even better. All in all it is was a pretty unremarkable place to visit. If you're in the area and have 15 minutes to kill it is worth calling in to get some honey cake, beyond that it is hard to find much else to warrant a stop beyond a tick off the list. I was in Christiansfeld, Denmark in July of 1995. I had met my future husband 3 months earlier when he was home in Ohio on leave. I went to Germany for a 2 week visit, and a couple of days before I was supposed to leave, we headed to Denmark and got married. We will celebrate our 14th wedding anniversary on July 21st. We spent about a week in Christiansfeld. We did a lot of sight seeing. We had a great time. I will remember it forever. We are hoping to go back some day. 84 Community Members have visited.